Mason's Story . . . This playful sweet senior has been gaining some much needed weight, not experiencing as many back leg and hip issues as he becomes stronger, and is even more handsome with a long, soft coat. He did have an inflamed eyelid which the vet diagnosed as a symptom of Horner’s Syndrome, a neurological disorder of the eye and facial muscles. He is taking meds for a short time to hopefully ease the condition. So far, Mason is responding to the treatment and no side effects have been observed. Mason is such a sweetheart in his foster home. He greets the morning at 5:30 a.m. and expects his family to give him a big hug and reward for sleeping through the night. He’s also learned that, while he can be interested in the resident cats, giving them a sniff before continuing on his way is a good practice! 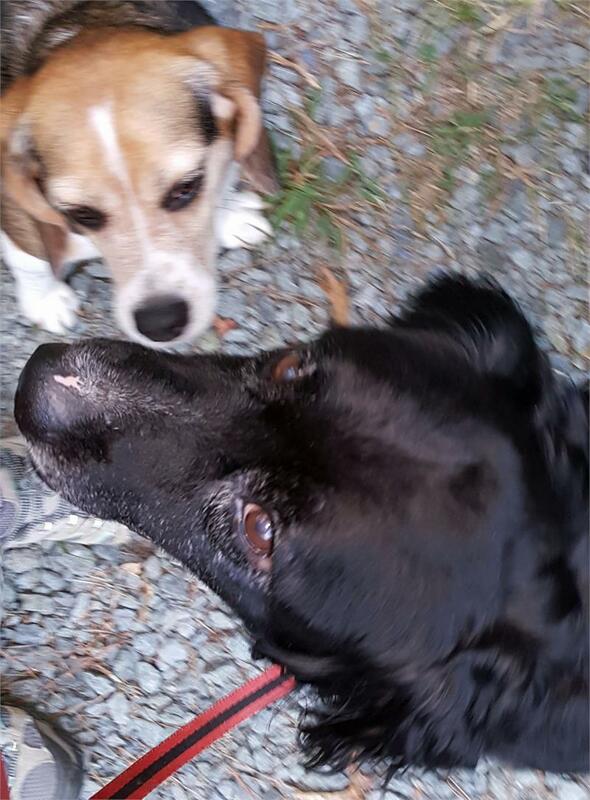 Mason enjoys his walks and seems to love meeting people. The vet and vet techs enjoy his visits. As a MAESSR boy, Mason has much to be thankful for this holiday season and, in turn, those he meets are thankful to know him. Keep watching as this love becomes stronger, healthier and ready for his forever home. This gent is doing very well and settling in quite comfortably. Unlike some of the rest of the world, Mason needs to gain weight and is slowly making progress doing so. His foster mom will learn just how well he is doing when he visits his vet next time. Mason walks daily on a leash for about 20 minutes and is very good. This senior fellow loves people and is very gregarious and outgoing; he is just naturally friendly…putting his neurotic foster brother to shame. Inside, his Springer side comes through also; he sheds a lot, causing his foster mom to vacuum every day. Fortunately, Mason likes to be brushed so that's a plus! 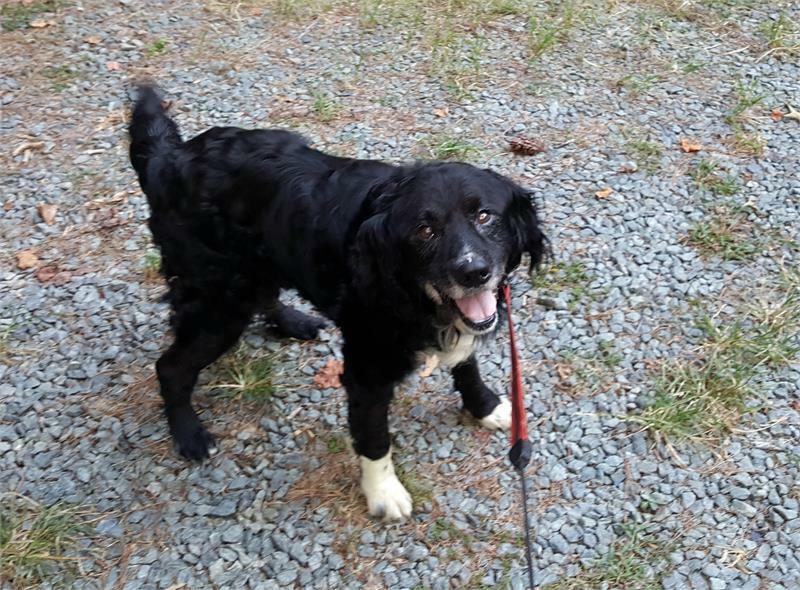 “Springer” is indeed a state of mind and this happy mix is enjoying his loving home, gaining weight, becoming healthy and will be looking for a forever family shortly. Check back as his story continues and for possible new pix!! Mason was picked up as a stray and taken to a North Carolina shelter. 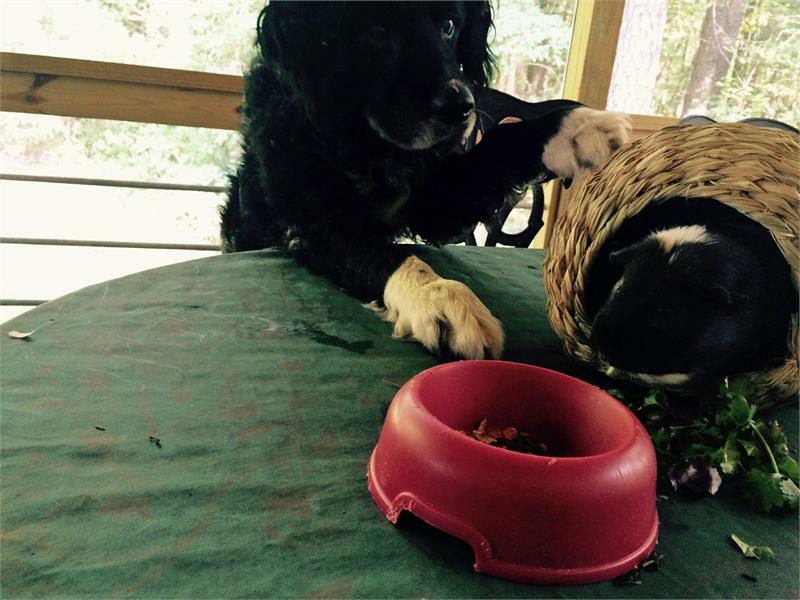 He was identified as part Springer, MAESSR was called, and the wandering fellow found himself in a warm and loving foster home. This senior has a long, beautiful tail—strong like a baseball bat--and short flat ears. 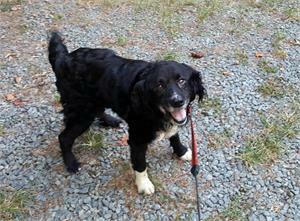 Unlike the Springers in his foster home, he’s tall and long bodied, but, like the Springers, he does like to cling or “supervise,” staying by his mom’s side as much as possible. So far, this gentleman hasn’t hopped up on any furniture, but, since he does snag food from the counter, his foster mom thinks he’ll also avail himself of a comfortable chair sooner or later. For now, he sleeps on a rug, the floor or a padded dog bed. All in all, this is a good dog—aren’t they all? He doesn’t trash dive or chew inappropriately. He is fed in the kitchen with the rest of the canine family, and, while he may growl if another dog approaches his dish, his foster mom is able to move it or add to its contents with no protest from this fine fellow. Mason is still very thin and weak; he has yet to play with toys and while he gets along with all, he has yet to really interact with his foster siblings. He pulls a bit on the leash and may never really be up for long walks. Car rides are an o.k. thing for him, and, although he was wonderful at the vets, he was terrified of the bath his foster mom tried to give him. MAESSR’s new boy is still getting used to “all the comforts of home.” He has apparently had a rough time and needs all the love and support he can be given. He will probably benefit most from an adult home and just might enjoy the company of a couple of his own kind for fun. Watch for updates as this guy settles in to the good life.